Toyota's Formica said engineers are carrying out 50,000 recall repairs a day in Europe. GENEVA – Toyota Motor Corp. apologized to its European customers over a recall crisis that has dented its reputation for quality and safety but said the company is not aware of any accident in Europe resulting from unintended acceleration. “Over the last few weeks, we have been going through the most extensive recall campaign in our history in Europe,” said Andrea Formica, Toyota Europe senior vice-president. Formica said that Toyota engineers were carrying out some 50,000 repairs per day, but he stressed that the company is “not aware of any accident in Europe” resulting from unintended acceleration. “We want to apologize to our customers for causing them any inconvenience,” Formica said at the Geneva auto show. Toyota said on January 29 that the accelerator pedal on some Toyota cars could become more difficult to operate or become stuck in a partially depressed position. It said the Euopean recall could reach up to 1.8 million cars and will affect the Auris, Avensis, Aygo, Corolla, iQ, RAV4, Verso and Yaris models built between February 2005 and January 2010. In a separate recall, 52,903 units of the third-generation Prius have also been recalled after customer complaints of inconsistent braking. Toyota said in a February 9 statement that the problem was due to faulty software that controls the Prius' ABS braking system. The Japanese company achieved its long-term goal to replace General Motors Co. as the world's biggest automaker by vehicles sold in 2009. 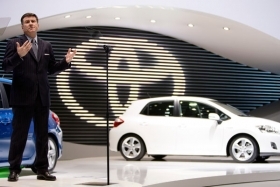 But critics argue Toyota's bid to catch up with the Detroit automaker distracted the company from its core values of quality and safety. The gas pedal problem has seen a total eight million vehicles recalled worldwide.